Figure 1. Glass in a silver brooch, hallmark from 1866. Private collection, photo by Jaroslav Hyršl. Tectites are members of a large group of impact glasses, formed by the collision of a meteorite on the Earth’s surface and the subsequent melting of surrounding rocks. The most famous tectites used as gemstones are moldavites from southern Bohemia in the Czech Republic. These were formed by a meteorite’s impact in the Ries crater in southern Germany 14.7 million years ago, about 500 km from their occurrence (V. Bouška, Moldavites: The Czech Tektites, Stylizace, Prague, 1994). Moldavites are popular for their pleasant green color, enigmatic origin, and interesting etched texture. They are used in jewelry, in either faceted or natural form. The price of moldavite has risen in the last few years, and as a logical consequence imitations have become more widespread. In fact, moldavite imitations are nothing new. Faceted moldavites were very popular in Czech jewelry during the second half of the 19th century, often with Czech garnets (chrome pyropes) or small river pearls. Their use diminished in the beginning of the 20th century when imitations made from green bottle glass began to appear. 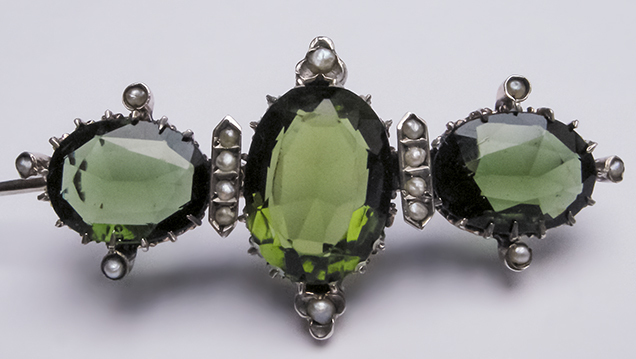 Nevertheless, the author’s recent study of five moldavite sets (bracelet, brooch, and earrings) from the second half of the 19th century in the collection of the Museum of Decorative Arts in Prague revealed an unexpected result. Only one set contained moldavites—a donation to the museum by Olga Havlova, the first wife of Vaclav Havel, the late Czech author and statesman. All of the stones in the other four sets proved to be glass imitations. This means that glass imitations have been around decades longer than previously thought (figure 1). Fortunately, the identification of faceted moldavite is simple. Besides their flow texture and abundant bubbles (almost always much more abundant than in an artificial glass), moldavites contain “wires” of lechatelierite, a high-temperature form of SiO2. Lechatelierite is very easy to see with a loupe due to its lower RI. Figure 2. Two moldavites from southern Bohemia, Czech Republic (top row) and two recent imitations from China (bottom row). The natural specimen on the top right measures 44 mm across. Photo by Jaroslav Hyršl. Figure 3. 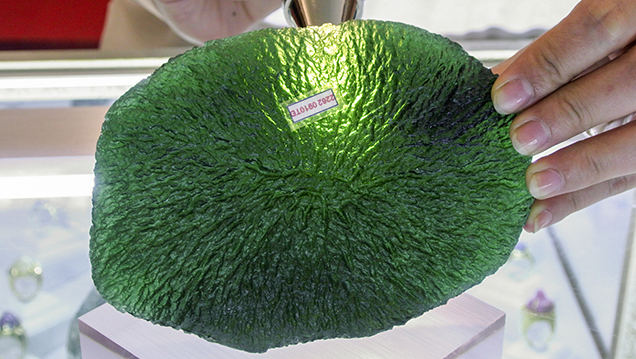 One of two huge moldavite fakes seen in Hanoi. Photo by Jaroslav Hyršl. The identification of moldavite with a natural-looking surface is much more difficult. 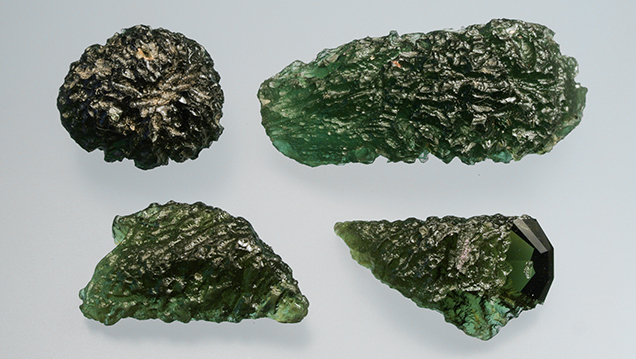 Rumors of moldavite imitations from China have been circulating among Czech dealers for many years, but only recently has the author been able to study some examples (see figure 2). Two large moldavite imitations were seen in a high-end jewelry shop in Hanoi during the 2013 International Gemmological Conference (figure 3). Their size was astonishing, because very few real moldavites weigh more than 100 g. Their shape was also too perfect, making them easy to recognize. Figure 4. Typical bubbles and inclusions of lechatelierite in natural moldavite; image width 5 mm. Photomicrograph by Jaroslav Hyršl. Chinese producers are now manufacturing small stones weighing just a few grams that are very realistic. The surface feature of natural moldavite is caused by natural etching, and an almost identical feature can be created artificially, likely in hydrofluoric acid. If the stone in question has a polished surface, the presence or lack of lechatelierite “wires” (figure 4, top and bottom) is the best diagnostic tool, along with refractive index (table 1). For rough, immersion in water or especially oil with a similar RI is very helpful to reveal lechatelierite. 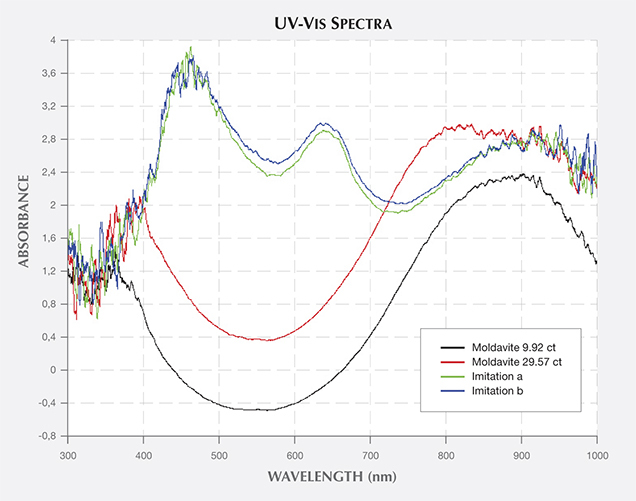 Imitation moldavite also has a different density, UV-Vis absorption spectrum (figure 5), and fluorescence (again, see table 1). The color of natural moldavites is caused by very low concentration of iron; all other tectites are more Fe-rich and therefore black. Fluorescence is particularly helpful because it may be used on large mixed lots. Some imitations are not fluorescent, however. One imitation seen by the author several years ago was not fluorescent, but its very high specific gravity of 3.60 immediately ruled out natural moldavite. TABLE 1. Characteristics of natural and imitation moldavite. Density 2.35 (2.27–2.46) 2.52–2.53 n.a. Absorption spectrum Minimum at 550 nm Maxima at 460 and 640 n.a. Figure 5. Absorption spectra of natural moldavite (black and red lines) and imitations (green and blue lines). Jaroslav Hyršl is a mineralogist and author in Prague, and a regular Gems & Gemology contributor.